I'm not a professional, nor even semi-professional luthier or a guitar builder. I do this for fun, for relaxation, and to develop the few guitar building skills that I've acquired, mainly from attending the build your own guitar (BYOG) courses run by Mark Bailey. As you'll see from the pic in the post below, not all the wiring on my "new" Kawai was quite as it should be. I believe that it's traditional for both ends of a wire to be connected to something. Apparently, circuits don't work too well if one end of the wire is just hanging around mid-air. So it turns out that electrickery isn't quite so clever after all. Anyways, with huge help from National Express (they couldn't run a train service if it was in "O" guage on their kitchen table) who considerately decided to delay my journey home by a couple of hours this week, I found enough time to work out the correct wiring diagram. Well, I say "I" did it, but actually I had a lot of help from my good friend Andy who also enjoys the service provided by National Express trains. And there's a new meaning to the word "service". (For readers not in the UK, "National Express" is a company which runs train services. I use the words "run", "train" and "service" in the loosest possible sense of the words. They frequently don't run - they stumble, slowly, then stop, in the middle of nowhere. They're barely trains - I'd call them museum pieces, but most museums look after their exhibits. And "service" ... well, my credit card gets hugely serviced every time I buy a ticket, but that's about the end of it). I grabbed this one from eBay last week. It was expensive as there were a couple of other bidders who seemed particularly keen on it. If you were one of those, please get in touch, as I'd be interested in knowing why you were so interested! The price was <£100 with about 20 seconds to go. In the last 10 seconds, the price went up a lot more than I expected it to! The eBay seller had found the guitar at a car boot sale. The previous owner says that it had been in a shed for many years prior to the car boot sale. And it looks like it! Unfortunately, not all wires are connected to where they should be connected, so the guitar is not producing any sound at all. A number of solder joints have clearly failed, but working out which wires should be connected where will take a while, and only then can I try re-soldering those joints. The controls are; Master Vol & Tone plus 3-way selector switch (all standard so far). Coil tap and phase mini-toggles (fairly standard options on many Kawai guitars). A 6-position varitone (that's a complex looking little switch!). But then it gets slightly more complex ... a pre-amp with level control and boost/distortion, all powered by a 9v battery. Inside the cavity we have 3 standard sized pots, 4 mini-toggle switches, a 3-way pickup selector, the Varitone switch, the pre-amp circuitry, the battery connector and a large output jack that allows the battery to be switched on or off. It's a standard sized control cavity. I'm going to need a small soldering iron! I've spent a couple of hours trying to draw out the "as is" state of the wiring, including the wires that don't get connected anywhere at the moment. Then I'll try to work out WHY they're connected as they are, and how to reconnect the "spare" wires. One day, my knowledge and competence with electrics - even basics like this - will reach the rudimentary stage. Right now, I'm nowhere near that level. So this project could take a while ... stay tuned for updates! My life has been completely swamped with work over the last few months. I've barely been into the workshop and there's certainly not been any guitar building activity. And I mean swamped to the extent of working 12-14 hour days, 6 days a week. I miss the challenges of guitar building and hope to get my life more balanced shortly. As well as building new guitars from scratch, another of my guitar-related interests is the Kawai brand of guitars (see - my site - http://www.kawaiguitars.com/ if you want to see what all that is about). This quick update is just to share that, after many months of not seeing any Kawai guitars for sale anywhere, 2 came up in the past couple of weeks. I've now got a couple of new additions to the collection, both of which needing some degree of TLC, which might at last force me back into the workshop. Not quite as exciting or creative as building something new, but I will (hopefully) at least get to spend some time fiddling with guitar set-ups on the bench. I've only just realised that I've not posted anything here for about 3 months. What happenned? Have I been in hibernation? Well, part of the reason is that "work" has been rudely interrupting my spare time over the last few weeks. Plus the time of year really doesn't help - when you leave home in the dark and don't return back until after dark, it's difficult to find the time or enthusiasm to wander off to a dark (and cold) shed. But the MusicRadar forum peeps are talking about repeating the £100 challenge again this year, so that should be the catalyst for some more shed time. 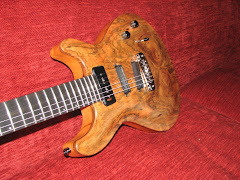 The featured guitar was made by John Pollock on the Bailey build-your-own-guitar course at the end of August. I know John well, and I know how much he was both looking forward to, and fearing, the course - wondering whether his woodworking skills were quite up to the job of building a guitar. As you'll see if you read the magazine (or it's on page 9 if you need to find it quickly at a newsagents! ), John's build turned out incredibly well, and he looks pretty pleased with it too. The guitar to John's right - you can only see the headstock and first few frets - was actually made by my stepson who (obviously!) attended the same course. He was pretty pleased with his creation too. Mark's course was how I started out on guitar-building a couple of years ago ... I still remember the incredible feeling of seeing something take shape before my eyes and under my hands - it really was one of my "life changing" events. Found another (couple of) Kawai guitars! It' s a Kawai "Rock 'n' Roll Star". Dates from the late 1970s / early 1980s. I've never seen one before, and if I didn't happen to have copies of the Kawai guitar catalogues from the period, I'd never have known that it existed. This guitar has had a bit of a hard, working, life, with plenty of scars, dings and dents. But the neck is undamaged and perfectly straight, and everything still works fine. It has the feature Kawai headstock (albeit a slightly damaged one) used on their guitars of that period. The twin humbuckers are coil-tapped via a push/pull on the tone knob. It's a nice enough guitar but isn't quite as "special" as the other Kawais. This one has been well cared for as there's barely a mark on it. I've seen a few for sale recently ... so I bought myself one to find out what they're like. I'll find out as soon as I put some strings on it! Ooops ... I think I just added another Kawai guitar to my little (but becoming bigger) collection. Details and pictures will follow when it arrives. Usually, fretboard radiusing is done using a shaped radiusing block, a lot of sandpaper, and a lot of effort. It can easily take an hour or more to work on an unshaped fretboard blank. Now I just need to make 10 necks to glue the fretboards to! I've just added the Blogger "reaction" element to each post. As you read the blog entries, please tick a category depending on whether the entry has been interesting (but not much else! ), helpful to you in some way ("thanks"), or just a complete waste of time ("no thanks"!). A quick update on my fascination (or obsession) with Kawai guitars. The website, cunningly called http://www.kawaiguitars.com/ has resulted in quite a few emails from other Kawai owners around the world, looking for info on their Kawai guitars. Some I can help, some I can't. Last week I received an email from Toddy (bass player with BlondieUK) who was repairing a Kawai Rock'n'Roll Star. This model is basically a single cutaway acoustic with steel strings and a humbucking pickup. Apart from in the old Kawai guitar catalogues, I'd never seen one before. Apparently it's in a sad state with the finish flaking off, some additional holes drilled in the body, and generally needs some TLC. A lot of TLC. Fingers crossed that it finds a good home!! I've played guitars for years, and always wanted to try to build one. In 2007 I found the Bailey build-your-own-guitar course. In 2008, I did the course again and that really gave me the bug. 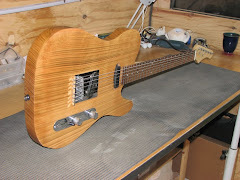 This blog will show the progress of my own self-build guitars.